This soft fabric has a special and fun appearance. 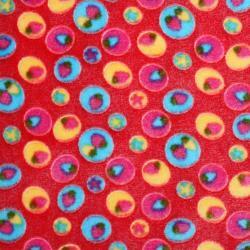 Cheerful motifs are printed on this fleece fabric and are ideal for making warm children's clothing. Quality: Polyester (100%) Width: 150 cm Weight: 270 g/m2 Product code: 5155068..
Quality: Polyester (100%) Width: 150 cm Weight: 270 g/m2 Product code: 5155069..
Quality: 1 (270) Width: Fleece cm Weight: 150 g/m2 Product code: 5155062..
Quality: Polyester (100%) Width: 150 cm Weight: 270 g/m2 Product code: 5155064..
Quality: Polyester (100%) Width: 140 cm Weight: 195 g/m2 Product code: 7025001..
Quality: Polyester (100%) Width: 140 cm Weight: 195 g/m2 Product code: 7025003..
Quality: Polyester (100%) Width: 140 cm Weight: 195 g/m2 Product code: 7025002..
Quality: Polyester (100%) Width: 150 cm Weight: 270 g/m2 Product code: 5155053..
Quality: Polyester (100%) Width: 150 cm Weight: 270 g/m2 Product code: 5155052..
Quality: Polyester (100%) Width: 150 cm Weight: 270 g/m2 Product code: 5155051..